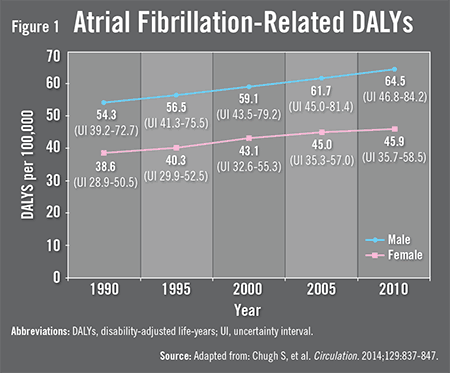 Research suggests that atrial fibrillation (AF) is the most common heart rhythm disorder, but the global burden of AF has not been estimated until recently. 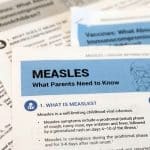 The World Health Organization (WHO) assesses the global burden of many public health concerns every 20 years through its Global Burden of Disease Project, but AF was not included in 1990 when the project was last conducted. 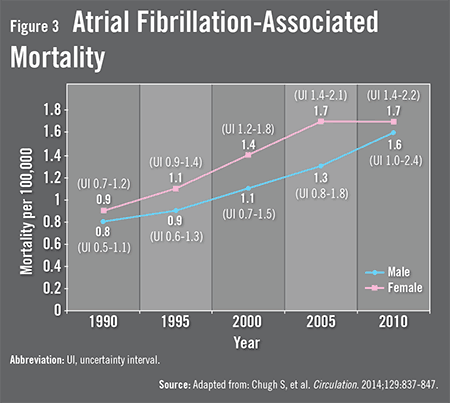 To establish the global and regional prevalence of AF—in addition to its associated incidence and mortality rates—Sumeet S. Chugh, MD, FACC, FHRS, FAHA, and colleagues systematically reviewed nearly 200 population-based studies of AF. Chugh S, Havmoeller R, Narayanan K, et al. 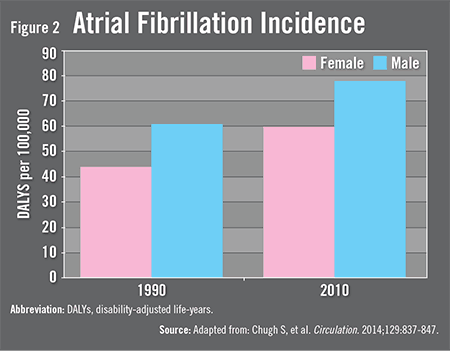 Worldwide epidemiology of atrial fibrillation: a global burden of disease 2010 study. Circulation. 2014;129:837-847. Available at http://circ.ahajournals.org/content/early/2013/12/16/CIRCULATIONAHA.113.005119.abstract. Thrall G, Lane D, Carroll D, Lip GY. Quality of life in patients with atrial fibrillation: a systematic review. Am J Med. 2006;119:448.e1-448.e19. Kim M, Johnston S, Chu B, et al. Estimation of total incremental health care costs in patients with atrial fibrillation in the United States. Circ Cardiovasc Qual Outcomes. 2011;4:313-320. Lloyd-Jones D, Wang T, Leip E, et al. Lifetime risk for development of atrial fibrillation: the Framingham Heart Study. Circulation. 2004;110:1042-1046. Sumeet S. Chugh, MD, FACC, FHRS, FAHA, has indicated to Physician’s Weekly that he has received grants/research aid from the Gates Foundation.